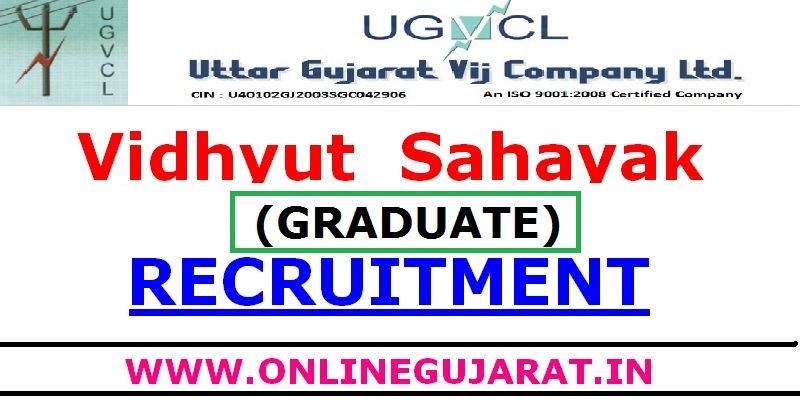 Uttar Gujarat Vij Company Ltd (UGVCL) has published a Advertisement for below mentioned Posts 2016. Other details like age limit, educational qualification, selection process, application fee and how to apply are given below. B.E. or B.Tech or equivalent Degree in Electrical Engineering from UGC recognized University with minimum 60% marks for UR category candidates and 55% for SC, ST, SEBC and UR-EWS category candidates. 5% relaxation for widow candidate in respective category. Graduate having BA, BCom, BSc, BBA, BCA from UGC recognized University with minimum 60% marks for UR category candidates and 55% for SC, ST, SEBC & UR-EWS category candidates. Above percentage marks is to be calculated of Final Year OR Aggregate of last two semesters. Junior Engineer - Electrical : Fixed remuneration for 1st and 2nd year would be Rs.19750/-and Rs.21750/- respectively per month. No other allowance or benefits would be admissible except coverage under Personal Accident Policy, Reimbursement of TA/DA whatever admissible to the category of Junior Engineer as per Company’s rules. Jr. Assistant : Fixed remuneration for 1st, 2nd and 3rd year would be Rs.7800/-, Rs.8550/- and 9300/-respectively per month. No other allowance or benefits would be admissible except coverage under Personal Accident Policy, Reimbursement of TA/DA as per category of Junior Assistant and will be eligible for 12 casual leaves in a year. application form fee, processing and scrutiny fee which is non-refundable. How to Apply : If you are the one who is looking for and interested in making a career in Power Sector, then apply online on or before 06-07-2016 and send the print out of application along with below mentioned documents so as to reach on or before 16–07-2016. 01. Print out of online application. 02. Two Passport size Photograph (To be pasted on Application Form which is generated after filling up the online application). 04. Attested Copy of Mark Sheets of SSC / HSC / Graduation (All year/Semester)/Post Graduation. 05. Attested Copy of Degree Certificate. (If belonging to SEBC category). 10. Latest Certificate in the prescribed format of “પrરિશbટ-અ/Parishisht-A” Gujarati only (If belonging to UR-EWS category). 11. In case of Dependent of retired employee, relieving Office Order should be attached. 12. In case of EX-Armed force Personnel, appropriate certificate should be attached. 13. Medical Certificate of Local Civil Hospital (For Physical Handicapped Candidates). 14. Identification Proof (Voter ID/ Pan Card/Aadhar Card/Driving Licence etc). 15. Residential Address Proof (Electricity Bill/Telephone Bill/Ration Card, etc). 17. Any Other relevant documents. 1. Application for the post of “Vidyut Sahayak (Junior Engineer)-Electrical”. The application received through other sources than RPAD/SPEED POST will not be taken into consideration.